As soon as I saw the scene in Shakedown‘s trailer featuring a grizzled Sam Elliott trading blows with an assailant while riding a roller coaster, I knew I had to see this film. 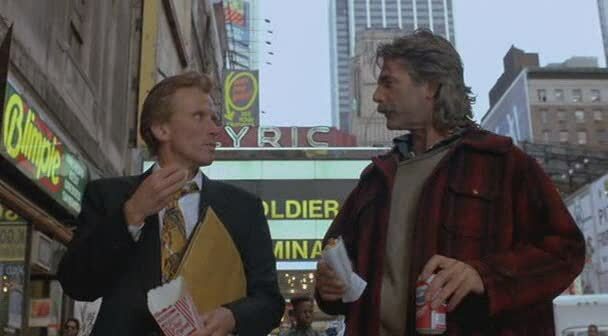 Directed by James Glickenhaus (The Soldier, The Protector), Shakedown is an uneven but lively 80s thriller that splits the difference between courtroom and street-level action as Sam Elliott and Peter Weller team up to pursue evidence for a drug dealer who murdered a crooked undercover cop in self-defense. James Glickenhaus continued to prove his ability in staging some cracking action scenes for Shakedown – with chases that range from 42nd street to the aforementioned roller coaster at a local carnival. Not unlike William Lustig‘s excellent 80s output, Glickenhaus understands how to bridge the gap between exploitation pot-boiler and mainstream thriller sensibilities. Sam Elliott and Peter Weller put in the work to sell some of the more silly scenes, and are joined by other familiar faces as well – including John C. McGinley and Antonio Fargas. The more ridiculous the thrills get though, the less credible the movie becomes – and the oddly abbreviated denouement certainly doesn’t help things. Entertainment value wins out in the end, with what might be one of Glickenhaus‘ most watchable pictures – especially if you still yearn for the gritty New York City-based action pictures of years gone by.